Home MIRIAM DEFENSOR SANTIAGO POLITICS Miriam Defensor Santiago dies: Kim Chiu, Heart Evangelista, Maine Mendoza & more mourn the death of the "Iron Lady of Asia"
Miriam Defensor Santiago dies: Kim Chiu, Heart Evangelista, Maine Mendoza & more mourn the death of the "Iron Lady of Asia"
Miriam Defensor Santiago has died this morning after years of cancer battle. The Philippine Senator for many years was 71 (June 15, 1945 - September 29, 2016). 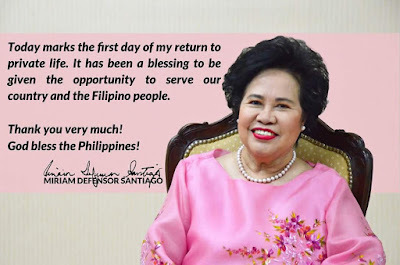 That was Sen. Miriam's FB post last July 1st, informing everyone of her first day in private life following many years of serving for our country. Almost 3 months later, "The Iron Lady of Asia" has died and now starting her Day 1 with our Creator. The heartbreaking news was announced in her official page, stating that she died peacefully at 8:52AM today and that details of her interment will be announced later. 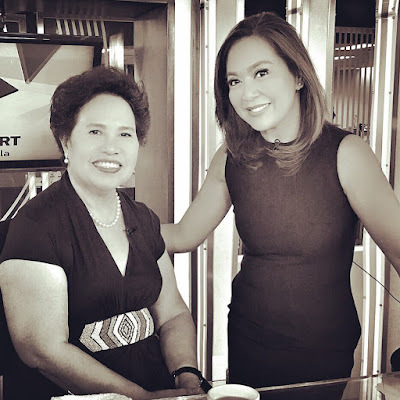 "Senator Miriam Defensor Santiago died peacefully today at 8:52am. Details of the interment will be announced later. We ask for prayers as her family goes through this difficult time." In social media, there's now an outpouring of grief over Senator Miriam's death as the whole country, celebrities and government officials mourn the loss of the best President we never had. Kim Chiu (@prinsesachinita): "RIP Sen. Miriam Santiago 🙏🏼 a woman full of wisdom and courage is now up in heaven.. nagulat ako news..."
Karen Davila: "RIP Sen Miriam. This was her last TV interview before election day. May 7, 2016 #ANCHeadstart Grit & Brilliance 🙏🏻 "
Maine Mendoza (@mainedcm): "Ang lungkot.. May you rest in peace, Sen. Miriam 😔"
Sen. Chiz Escudero (@SayChiz): "My sympathies to Sec. Jun & Sen. Miriam's family & loved ones. She was one of the greatest & I owe her a lot! She will be greatly missed..."
Sen. Sonny Angara (@SonnyAngara): "RiP Sen Miriam. 😢 you will be missed. Thanks for the many years of courageous service to the nation 🙏"
Sen. Joel Villanueva (@JVillanueva2016): "My thoughts and prayers are with the Santiago family during this extremely difficult time. God bless. #RIPMiriam #ThankYouMiriam"
Jeron Teng (@jeronteng): "RIP Sen Miriam. Thank you for serving our country well! 🙏🏼"
And perhaps the most affected of them all and the one who's grieving really hard, other than the Santiago family, is Sen. Chiz's wife, actress Heart Evangelista who has been posting pics of her with Sen. Miriam in both her Instagram and Twitter accounts, recalling those happy moments she had with her "2nd mom" and "supermom". 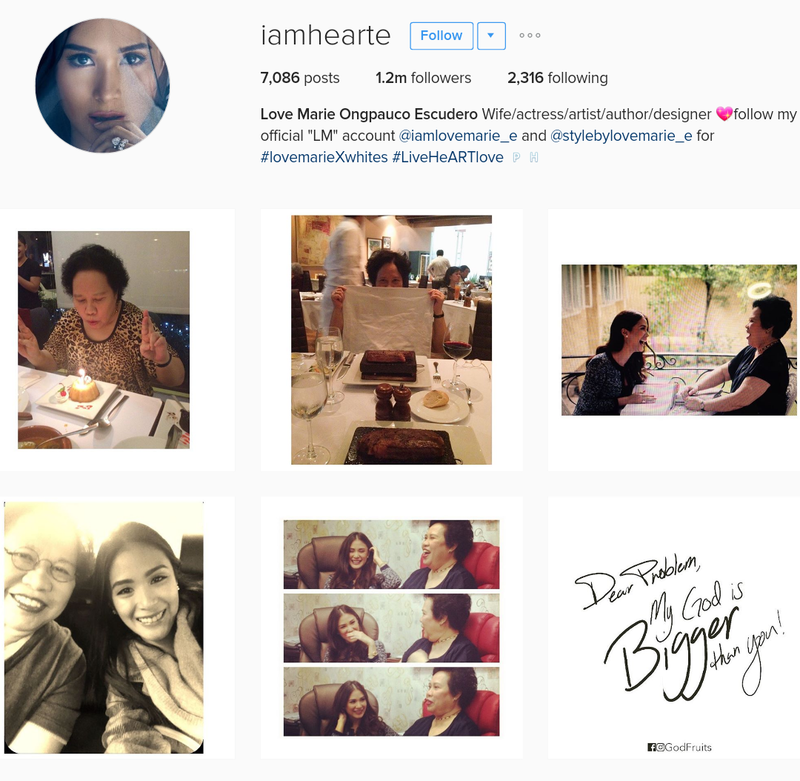 @iamhearte: "You would read vogue for me and in return I would study your law books... You made me study the "serious Einstein subjects" and bring me to meet the "kings and queens" the way you would say it... You showed me so much of the world, put on my slippers when I had a migraine and fed me the best lobsters in bed...i would sleep over for weekends and stay up till 2am and we would talk about cleopatra and grace Kelly... Your big hair and workout clothes, your lambing tone,your sweetness and kisses... When this photo was taken a halo appeared on my screen... Indeed you were and will always be my guardian angel..."